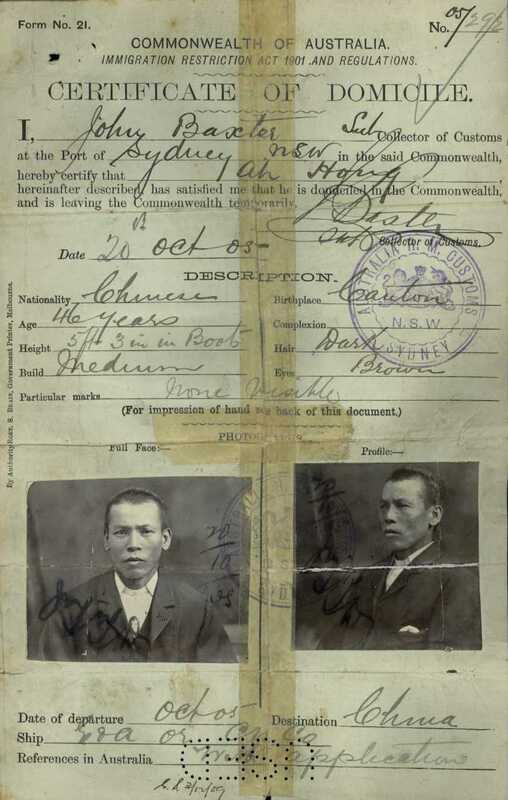 Early in 2012, I discovered the NAA’s digitised version of my adoptive grand-uncle [Cheng] Chun Wah’s (duplicate) immigration file. 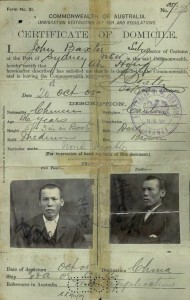 My great-grandfather Henry Fine (Ah Hing aka Cheng Fan Chong aka Henry Fine Chong ) sponsored his nephew’s education for 20 years, until his graduation from Sydney Uni in 1931. The original paper copy in the Sydney Archives facility (which runs to some 100 pages) includes lots of interesting snippets, including the bond lodged by Ping Nam and Cheong Leong. 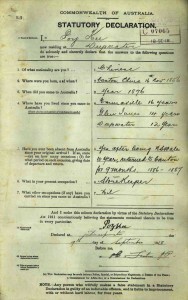 The SYDNEY copy of the police report on Henry Fine records him as claiming to have a brother (named as “Sam Daw”) in Gunnedah circa 1910. The surviving members of the family have no record of said uncle. The Gunnedah Family History Society has provided me with a couple of references to a shop of this name (ie Sam. 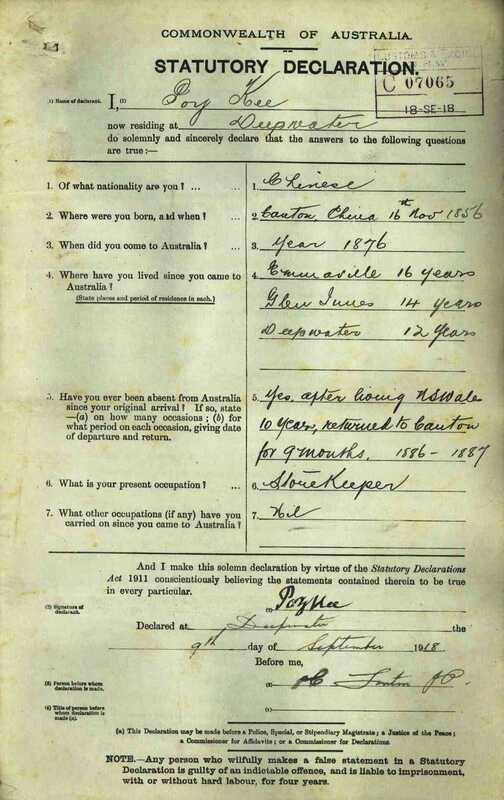 Daw, implying ‘Samuel Daw’), but I have found no other immigration or BDM record at all under this name. Any ideas about how to track him, or any descendants, down? Thanks for getting in touch. It sounds like you’re uncovering a fascinating family story. I suspect that I don’t have any ideas for tracking down the elusive Sam Daw that you haven’t already considered. First I’d say to try searching under any possible permutation of the name Sam Daw — even things that seem unlikely (like Taw or Thaw or Dow or Tow, for example). Local newspapers are often a winner. If the local Gunnedah paper isn’t digitised in Trove, I’d have a look at issues around 1910 to see if there are any ads for his shop or other articles that could provide a clue. Do you have an address for the shop in Gunnedah? Are there any local histories of Gunnedah that might mention Chinese living in the town? Have you checked post office directories? I also find that using the NSW BDM CD-rom is sometimes more effective for searching than the online indexes, particularly because it allows you to search in more ways. For example, you could try searching for all entries in Gunnedah in the period of your interest — might take some time to wade through the entries, but it could bring up a strange spelling of the name that you never would have considered. You could also check in any original registers for the local churches, to see if any children were baptised? Hope this helps, and thanks again for getting in touch.